I make pork roasts all the time, but this new method is going to be the only way I make pork carnitas from now on! It’s faster and tastes better! I was in a hurry to get dinner ready, so I cut my pork shoulder roast into small cubes, then seared them and let them simmer for about 1.5 – 2 hours and it was already falling apart it was so tender. I then drained the liquid and turned up the heat and let the outside get a little crispy and blackened with the seasoning. This is where all that extra flavor comes in! Served on a warm tortilla with avocado and salsa. Mmmm…my mouth is watering! Toss the pork with the chili powder, garlic, salt, and pepper. Then add the Dr Pepper and water to the pork and bring to a boil. As soon as it comes to a boil, turn the heat to simmer (low) and cover with a tight fitting lid. Cook for about 2 hours, until pork easily falls apart. Remove the lid and discard almost all the juices. (Just leave enough to coat bottom of pan). On medium heat, allow the pork to caramelize on the bottom of the pan. I usually add a little more salt (to taste) and shred the meat. 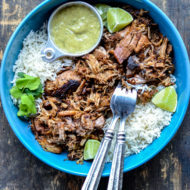 You can squeeze a lime over the meat and serve with warm tortillas! Garnish with cilantro and avocados. 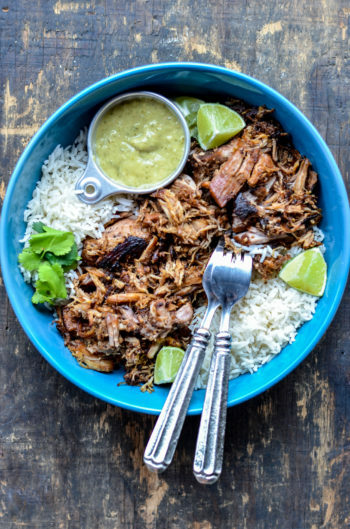 Pork Carnitas is very delicious when served with salsa verde, as well!